I shared many tutorials about BlueStacks before and tried many android emulators for PC which could access many apps fluently. Recently, I came to know about an Android app player which could perform much better than any other emulator available on the internet and it is even beating BlueStacks(Most Used Emulator). Yes, I am talking about Nox APP Player which has all those capabilities in it. 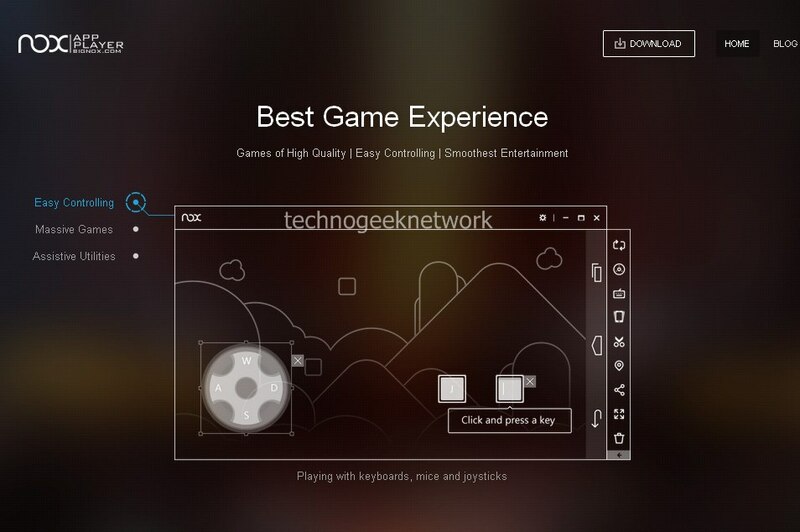 Nox App Player allows you to run Android games and apps on your PC and take advantage of a bigger screen. By creating a virtual android OS on a PC, Nox App Player enables PC users to use Android apps and play Android games on a desktop with the benefit of a bigger screen, better hardware performance and easier control. 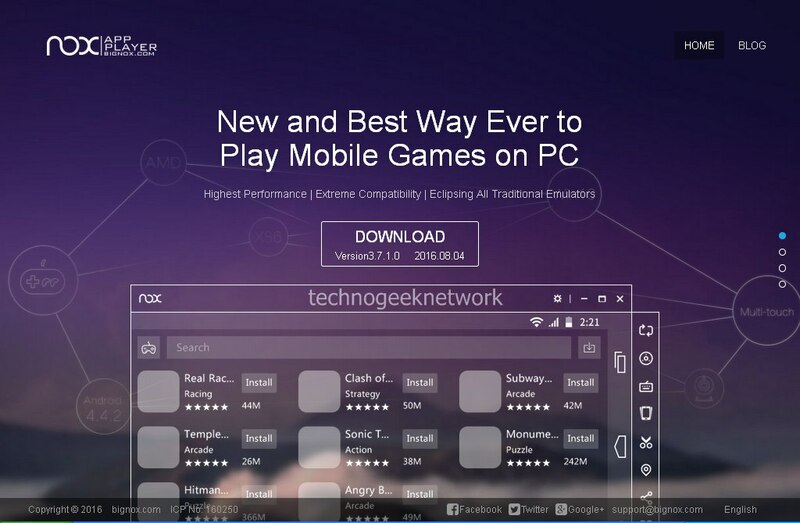 Developed on Android 4.4.2 kernel Similar to other Android Emulator, Nox App Player is built on a custom virtual machine, but there's still something worth highlight. It is developed on Android 4.4.2 kernel which has surpassed Bluestacks' technology. Higher compatibility is therefore deemed possible. The software adopts the UI of physical Android phones and tablets so it's easy to use. Compatible to run on Windows 10 Nox App Player runs smoothly on Windows 10 computers. Considering that Windows 10 was just released at on 29th July, this is really a fast move. It shows the Nox develop team's efficiency and tested developing ability. Support input/out put devices, gamepad and controller Keyboard typing, camera and microphone integration are basic functions of Nox App Player. What made using Nox App Player special is that you can connect gamepad and controllers in a game, you can also map the WASD key to control your character in the game, and you can set other keys to release skills or take shots. Multiplayer mode which could be activated with ease The multiplayer mode is an innovative feature which makes it possible for users to run several Nox App Player window at the same time. Each window could run a different app/game. So instead of pushing other apps to the background, user can switch between them with ease on the same computer screen. This is like having several phones for real-time multi-tasking. The activation process is also made simpler. There's a desktop shortcut for this function and within a few clicks a second Player is boosted. Depending on the configuration and performance of the host computer, one could have several Nox App Players running in parallel. Customize CPU/RAM occupation and resolution To enhance the multiplayer mode and to bring the fun to people who only have limited budget PCs, this function allows users to customize the CPU occupation and RAM of each Nox App Player. So what's special about Nox App Player? You can also play Pokemon Go on your Windows PC or laptop with the latest version. To download this amazing player on your PC/Laptop with Windows 7,8,8.1 or 10 installed in it, you need to either select the offline or online installer of Nox App Player given right here. If you want the latest version of this android emulator, go for the offline installer. But if you want your player to be updated with latest releases, you can prefer online installer with gets updated automatically when added something new to it. To download it, your PC/Laptop must have these things in it. If your PC is having all these essential requirements then you can easily install the package and enjoy Nox app player. As far as my opinions are concerned about the Emulator, I could easily recommend this app to anyone because it is one of the finest work and as well as a big competitor for previously used Emulator like Bluestacks which has many issues related to graphic, speed and many limitations on the use of applications. A long time ago, I used BlueStack, after which I was advised to try Nox. One day, I started to notice that the software is eating a lot of resources of my laptop. I consulted with the programmers. Now I ordered the writing of my personal emulator software development service. Project deadlines are already close, at the market will be available soon the best software for emulation.